← Baltimore Screening Pass-palooza: “Wish Upon”! Baltimore Screening Pass-palooza: “The Beguiled”! Sometimes sanctuary isn’t what it seems…I’ve got passes for the Baltimore area screening of The Beguiled. But don’t get too cozy, you never know what’s in store… Synopsis! 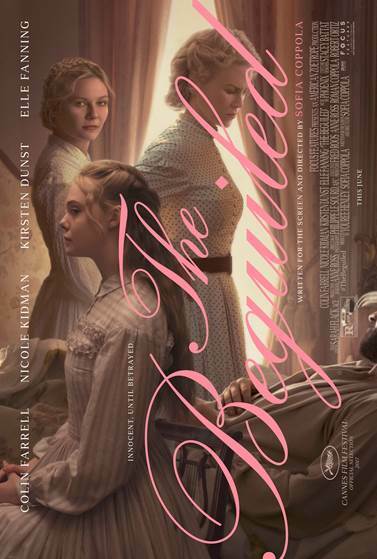 “The Beguiled” is an atmospheric thriller from acclaimed writer/director Sofia Coppola, winner of the Best Director award at the 2017 Cannes International Film Festival. The story unfolds during the Civil War, at a Southern girls’ boarding school. Its sheltered young women take in an injured enemy soldier. As they provide refuge and tend to his wounds, the house is taken over with sexual tension and dangerous rivalries, and taboos are broken in an unexpected turn of events. So, ready to take refuge? Let’s go! What: ADMIT TWO passes for the Baltimore area screening of The Beguiled! Why: Eerie historical story, FTW! 1 Response to Baltimore Screening Pass-palooza: “The Beguiled”!